Marsh, John S.. "Provincial Parks". The Canadian Encyclopedia, 30 May 2018, Historica Canada. https://www.thecanadianencyclopedia.ca/en/article/provincial-parks. Accessed 25 April 2019. 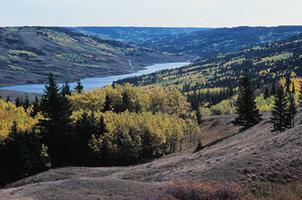 This image of Reesor Lake in Cypress Hills Interprovincial Park depicts mixed spruce, aspen woodland and fescue grassland (photo by Cliff Wallis, courtesy Cottonwood Consultants Ltd.). Provincial parks are areas of land and water, large or small, natural or man-modified, designated by any of the provincial governments for the purposes of nature protection, recreation, TOURISM, historic preservation and education. They range in character from Polar Bear Provincial Park on Hudson Bay, a 24 087 km2 wilderness park visited by less than 500 people each year, to Bronte Creek Provincial Park, a 6.4 km2 recreation park near Toronto which received 302 327 visitors in 1994. As in the case of national parks, provincial parks originated at the end of the 19th century as a result of growing concern among civil servants, politicians and the general public about the depletion of natural resources, the degradation of scenic places and the need for an ever-expanding and increasingly urbanized population to have opportunities for recreation in a natural setting. The first provincial park, Queen Victoria Park at Niagara Falls, was established in 1885. ALGONQUIN, established in 1893, was the first Canadian provincial park established to protect a natural environment. The idea for such a park was conceived in 1885 by an Irish immigrant, Alexander Kirkwood. As a clerk of the Crown Lands Department, he had become concerned about the destruction of the northern forests and wildlife and was impressed by the new NATIONAL PARKS at Yellowstone in the US and BANFF in the Canadian Rockies. Kirkwood advocated the creation of a National Forest and Park called Algonquin to "perpetuate the name of one of the greatest Indian nations that has inhabited the North American continent." His enthusiasm and the practical support of a provincial land surveyor, James Dickson, led to the appointment of a royal commission and to the investigation of 18 townships in the District of Nipissing, south of the Mattawa River and lying between the Ottawa River and Georgian Bay. In 1893 this area, Algonquin, was declared "a public park and forest reservation, fish and game preserve, health resort and pleasure ground for the benefit, advantage and enjoyment of the people of the Province." Initially the park was a remote wilderness, still subject to lumbering but afforded improved fire and wildlife protection. However, as communications improved and accommodation was provided, its recreational function gained in importance and, in the early 1900s, it became a fashionable destination for tourists wishing to canoe, fish and camp in a wilderness setting. The next provincial park, RONDEAU, comprising a peninsula on the north coast of Lake Erie, was declared in 1894. Featuring a Carolinian FOREST of species normally found farther south, and frequented by numerous migratory birds, it was already popular with duck hunters and picnickers. Over the next 50 years, as demands for CONSERVATION and recreation areas increased, 5 other provincial parks were established in Ontario. 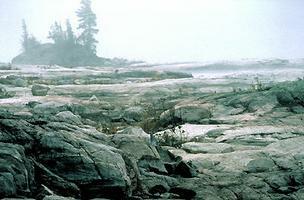 In the granite SHIELD and BOREAL FOREST, Quetico was created in 1913 and LAKE SUPERIOR in 1944. Along the GREAT LAKES shoreline, Long Point was designated in 1921, Presqu'ile in 1922, Ipperwash in 1938 and Sibley (now Sleeping Giant) in 1944. Québec's first provincial parks were created contemporaneously to those in Ontario and for similar reasons. In 1895 the Laurentides north of Québec City and MONT-TREMBLANT north of Montréal were created to protect the forests, fish and wildlife for public benefit; however, resource exploitation continued in these areas. Other provincial parks were designated in the 1930s: Gaspésie in 1937, Mont-Orford in 1938 and La Vérendrye in 1939. In the last 30 years many smaller parks have been established near cities to meet the demand for recreation in a natural setting. British Columbia was the first western province to create provincial parks. STRATHCONA, a mountain and lake area on Vancouver Island, gained park status in 1911 as a result of public support from such groups as the ALPINE CLUB OF CANADA, the BC Natural History Society and the Vancouver Island Board of Trade. Attention then focused on the mountains and glaciers of eastern BC, Mount ROBSON being declared a provincial park in 1913, followed by GARIBALDI in 1920 and MOUNT ASSINIBOINE and Kokanee Glacier in 1922. The province's largest park, 9810 km2 Tweedsmuir, located in the Coast Range, gained park status in 1938; Wells Gray, in 1939. In more recent years many more provincial parks, including large wilderness areas and small recreational sites, have been designated near cities in the south, as well as in the north. Provincial status and ownership of resources came later to the Prairie provinces, and so did provincial parks. While the federal government designated national parks and forest reserves in the prairies, it was only with the transfer of resources legislation in 1930 that provincial parks, often originally forest reserves, were created. Alberta passed a Provincial Parks and Protected Areas Act in 1930; 2 years later, Aspen Beach, Park Lake, Gooseberry Lake, Saskatoon Island, Sylvan Lake, Lundbreck Falls, Ghost River and Hommy were declared provincial parks. The last 3 were later deleted from the park system but, after jurisdictional changes in 1951 and 1967, more and larger parks were created. By 1972 Alberta had 51 parks totalling 567 km2. Saskatchewan's first 3 provincial parks were created in 1931 from the former forest reserves of Duck Mountain, CYPRESS HILLS and Moose Mountain, Manitoba likewise took over the management of forest reserves such as TURTLE MOUNTAIN and Spruce Woods but the province's first provincial park, WHITESHELL, was only established in 1961. The Atlantic provinces began establishing provincial parks in the 1950s, when recreation opportunities in natural areas relatively close to cities were increasingly in demand. Parks with both a recreational and nature conservation orientation have now been established but the number and area remains relatively small. Territorial parks in the YT and the NWT are an even more recent innovation, primarily because most land in the territories is federally owned, recreation demand has been very limited (because of the small population and low levels of seasonal tourism), and because unspoiled wilderness is generally quite abundant. Today, over 100 years after the first provincial park was established, all provinces have provincial park systems which usually consist of provincial parks and various other land units designated for recreational and nature conservation purposes. Each provincial system is different, and new parks are being designated each year. Provincial parks are administered by provincial government agencies which are commonly part of departments dealing with natural resources, tourism or culture. For example, Ontario Parks is a special agency of the Ministry of Natural Resources; in BC it belongs to the Ministry of Environment, Lands and Parks. Staff are located in offices in the provincial capitals, in regional offices and in the parks, where a superintendent is normally in charge, assisted by wardens and interpreters. Most provincial agencies have developed park system plans that guide decisions on how many parks are needed and what characteristics, size and location are appropriate. A management plan is normally prepared for each park to facilitate decisions on the protection of the park environment, on the development of facilities and the provision of services. Given the wide variation in the character and purpose of parks, many agencies classify parks (eg, as wilderness, recreation or historic) and manage them accordingly. Because parks, especially large ones, are diverse in character and purpose, they are often zoned, some areas being designated for strict nature protection and others for tourism development. The classification and zoning of a park is difficult and may require public involvement. In trying to protect park environments, yet allow them to serve the needs of visitors, park agencies face many management problems. Few parks are now ecologically self-sufficient; hence, management is needed to deal with fires, wildlife imbalances, diseases of animals and vegetation, and human impacts. The use of parks by visitors necessitates the provision and management of accommodation, transport and recreation facilities, information and education services, and safety features. Some of the problems facing park managers in recent years include maintaining fish stocks; preventing FOREST FIRES, littering and vandalism; protecting visitors from bears; eliminating poaching; reducing crowding in popular areas; dealing with new technologies (eg, snowmobiles, hang gliders, wind surfers); and reducing accidents from risk activities (eg, mountaineering, canoeing, winter camping). In recent years, to improve planning and management, environmental protection and visitor satisfaction, park agencies have undertaken more research and have regularly consulted the public through surveys and public hearings. Increasingly, opportunities are being provided for private enterprise, public interest groups and volunteers to become involved in running parks. In 1996, British Columbia had 443 provincial parks, 131 ecological reserves and one wilderness area, totalling 78 000 km2. Parks range from large, remote wild areas such as Tweedsmuir, to marine parks and small, recreational parks near cities. The provincial parks are divided into 3 classes: class "A" comprises 391 fully protected natural or historic parks in which no commercially extractive industrial uses are permitted; discrete and regulated resource extraction is allowed in the 2 class "B" parks; the 21 class "C" parks are small, local, primarily recreational in character and, in time, will be transferred to local government jurisdiction. In 1995 the BC provincial park system received 24.6 million visitors. In 1996, Alberta had 67 provincial parks, 3 wilderness areas, over 300 recreation areas, 14 ecological reserves and Willmore Wilderness, together encompassing over 10 000 km2. They range in character from large, lightly used, unspoiled wilderness areas in the Rockies (eg, Siffleur) to heavily used water-based recreational parks in the more populated areas of central and eastern Alberta (eg, Sylvan Lake). In addition there are preserved areas such as bison jumps, fossil beds, native rock art and other sites of historical significance (eg, DINOSAUR PROVINCIAL PARK). In 1996 Alberta's provincial park system received approximately 9 million visitors. In 1995, Saskatchewan had 34 provincial parks with a total area of 11 482.87 km2 and 150 recreation sites containing 422.22 km2 of the province. There are 4 classes of provincial parks: historic (of which there are 9, covering 274.0 ha), recreation (10, covering 146.94 km2), natural environment (11, covering 6774.63 km2) and wilderness (4, encompassing 4558.56 km2). As well, the parks system includes 22 protected areas and 8 HISTORIC SITES. Saskatchewan also has 101 regional parks. In 1995 Saskatchewan's provincial park system received 2.3 million visitors. In 1994, Manitoba had 102 provincial parks covering over 10 000 km2. They are designated as natural, recreational, heritage, wilderness and wayside. WHITESHELL, east of Winnipeg, is a natural park, as is Nopiming, a Saulteaux word meaning "into the wilderness. "HECLA is a heritage park and Atikaki is the only wilderness park. In 1994 Manitoba's provincial park system received over 3 million visitors. In 1995, Ontario had 265 provincial parks encompassing 63 4981 km2. Additional lands designated by provincial conservation authorities (1334 km2), wilderness areas (618 km2) and a variety of other areas also serve nature conservation and recreational purposes. The park system includes wilderness areas (eg, Quetico, 4758 km2 ), historic sites (eg, PETROGLYPHS, 1555 ha) and intensively used recreational areas (eg, Wasaga Beach, 15km2). The provincial parks are categorized as follows: wilderness (of which there are 8, covering 41 391.73 km2), natural environment (65, covering 11 900.29km2), waterway (29 of 8873.99 km2), nature reserve (88 of 915.42 km2), recreation (71 of 395.70 km2), and historical (4 encompassing 2019 ha). Since 1983, 132 new parks have been established and several new areas have been proposed as provincial parks. The most significant of these is an 8000 km2 expansion to Wabakimi Provincial Park in northwestern Ontario. In 1994 Ontario's provincial park system received 8.3 million visitors. In 1995, Québec had 17 provincial parks, including 3 in the process of designation, encompassing 4248.87 km2; another 18 areas north of the 50th parallel have also been set aside. The system includes large wilderness areas (eg, Mont-Tremblant - 1490 km2) and smaller areas (eg, Miguasha, a world-class paleontogoical site - 62.3 ha). Since 1977 they have been classified as conservation parks and recreation parks. In 1994 Québec's provincial parks registered 3.4 million visitor days of use. In 1995, New Brunswick had 33 provincial parks, varying in size from 17 427 ha (Mount Carleton) to 0.2 ha site and beach parks. In 1996 the system was being downsized, with 12 parks transferred to municipal governments, voluntary, nonprofit organizations and the private sector. In 1995 they received nearly 2.5 million visitors. In 1995, Nova Scotia had 119 provincial parks, the operational ones covering 92.15 km2, and reserve areas, 190.10 km2. Primarily oriented to roadside, coastal and urban recreation, they are classified as campgrounds and day use (picnic, beach or roadside rest sites). An estimated 2 million visitors used these parks in 1995. In 1996, Prince Edward Island had 30 provincial parks encompassing 17 km2. Almost all of the sites dot the coast and include combinations of recreation, natural environment and historic features. Several carry a second designation under the Natural Areas Protection Act. Annual visitation to the provincial parks was last estimated in 1990 at 500 000. In 1996, Newfoundland had 64 provincial parks encompassing 4373.28 km2. The system comprises 32 regional, 13 natural scenic attractions and 3 Keystone parks. In 1995, these parks had over 1.8 million visitors. The provincial parks program was expanded in 1986 and now includes the administration of 13 ecological reserves; notably, SEABIRD sanctuaries, covering 84.03 km2, and 2 wilderness reserves covering 3965 km2 and 2 provisional reserves. The Yukon Territory has 2 territorial parks, Herschel Island established in 1987 and Coal River springs established as both a territorial park and an ecological reserve in 1990. There are also 41 campgrounds located along the major road network in the territory; and 11 recreational sites at scenic spots along the highways usually featuring interpretive signs or self-guided trails. The Northwest Territories had some 45 territorial parks in 1996, covering 31 km2, and more and larger areas are proposed. They are classified as natural environment recreation, outdoor recreation, community, wayside and historic parks. In addition, there were 3 wildlife reserves covering 12 321 km2 and 9 critical wildlife areas covering 140 000 km2. The new territory of Nunavut has 3 territorial parks: Bloody Falls, Ijiraliq (Meliatline) River and Katannilik Territorial Park Reserve. Canadian Parks and Wilderness SocietyThe website for the Canadian Parks and Wilderness Society. Grass River/Wekusko Falls Provincial ParksThe Manitoba website for Grass River and Wekusko Falls provincial parks. New Brunswick ParksDiscover the beautiful national, provincial, and municipal parks throughout the province of New Brunswick. Société des établissements de plein air du QuébecSépaq is a government agency mandated to operate and develop natural sites and tourist facilities entrusted to it under its act of incorporation. Its mission is to ensure the accessibility, development, and protection of these facilities for the benefit of its clientele, Québec's regions, and future generations.